You know I love to sneak cottage cheese into dishes. 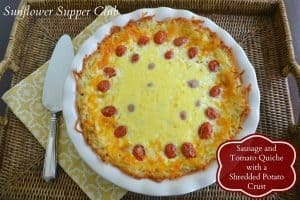 Remember my Wonderfully Creamy One Pot Macaroni and Cheese and Crustless Ham and Cheese Quiche? I know I say it every time, but you won’t taste it. I just love how creamy it makes a dish. We are big breakfast eaters at our house and this is great because it saves well. It will make a terrific breakfast or lunch for you the next day. Try it with ham or bacon, add some green pepper, and it is perfect for the holidays which will be here before we know it! Where has this year gone? Well, that is a post for another day! Preheat oven to 375 degrees. Spray a 9½ inch deep dish pie plate with cooking spray. Set aside. Place the shredded potatoes in a medium bowl and mix with the olive oil, kosher salt, and pepper. Transfer the shredded potatoes to the prepared pie plate. Press down firmly on the bottom and up the sides of the dish to form a crust. Place in the oven and bake for 14-15 minutes. Rinse the grape tomatoes and cut in half lengthwise. Place cut side down on a paper towel lined plate to drain. Cook the breakfast sausage, onion, and garlic in a medium skillet until cooked through. Combine the eggs, cottage cheese, sour cream, hot sauce and shredded cheese and whisk to combine. Place the cooked sausage in the bottom of the pre-baked shredded potato shell. Arrange the grape tomatoes evenly over the top of the sausage. Carefully pour the egg mixture evenly over the shell. Return the oven and continue baking for 35-40 more minutes until a toothpick inserted in the center comes out clean. Tent the edges of the quiche with foil if the potatoes are getting too brown.